We often warn readers to be wary of false precision. This presidential tweet is a good example of this. He describes, to the dollar, the alleged cost of illegal immigration — as well as the exact number of undocumented immigrants. But both numbers can only be estimates; there is no actual count of undocumented immigrants, and there is a big dispute over what kind of financial drain, if any, illegal immigration places on the United States. An image from One America News Network indicating the alleged cost of illegal immigration in the United States. Looks rather similar! But it’s quite possible the president missed an important nuance. The OAN chart refers to “total aliens,” not “illegal aliens.” So it appears to be a number for all immigrants, not just illegal immigrants. Neither the White House nor DHS responded to requests for an explanation of the president’s numbers. Even acting White House chief of staff Mick Mulvaney told CBS’s “Face the Nation” that he didn’t know the source of the president’s figures. Let’s explore. In December, DHS released a report that there were nearly 12 million undocumented immigrants living in the United States in January 2015. The report said the population had dropped after reaching a peak in 2007, before the Great Recession, but there had been a gain of 800,000 between 2013 and 2015, “a result that may have been driven in part by rising unlawful arrivals at the southwest border in 2014.” But still, the report said, “the 2015 population was likely substantially smaller than the 2007 peak." The same report indicated there are 24.5 million legal residents in the United States, so the combined immigrant population would be about 36 million, not 26 million as indicated in the OAN tally. We sought a response from OAN for how its numbers were calculated but did not receive a reply. The DHS estimate of 12 million in 2015 is within the range of other estimates by outside groups. The Center for Migration Studies estimated the number in 2015 was about 11 million; as of 2017, the undocumented population has fallen to 10.7 million, the group estimated. That represented a drop of more than 1 million since 2010. A Yale University study in 2018 estimated the undocumented immigrant population could be more than 22 million, but that estimate was rejected by many experts in the field, including from organizations that seek to limit immigration, as not plausible. But even the Yale estimate agreed the population size has been relatively stable since 2008; it just assumes higher (previously unknown) growth in the 1990s. Moreover, a population of that size would undercut Trump’s frequent claims that undocumented immigrants spread crime because the findings “suggest that the [crime] rate is even lower than previously believed,” the study said. If you do the math, Trump estimates that each undocumented immigrant costs the United States $8,545 a year, or more than $220 billion. Trump’s numbers are “considerably higher than our estimate,” said David Ray, a FAIR spokesman. The FAIR estimate is already considered a rather high estimate — one that is fiercely disputed. The Cato Institute, which favors immigration, said the study had serious methodological errors that, once considered, reduced the fiscal cost to $3.3 billion to $15.6 billion before accounting for economic activity generated by illegal immigrants. The Center for Immigration Studies (CIS), another group skeptical of current immigration laws, estimated each undocumented immigrant cost $70,000 during a lifetime. Depending on life expectancy, that’s considerably less than FAIR’s annual estimate. Note that OAN, the apparent source for Trump, suggests both FAIR and CIS are sources for its numbers, even though its figures are totally different. Clearly, there are many ways to crunch these numbers. Undocumented immigrants generally pay taxes, such as Social Security, but receive no government benefits. Moreover, while undocumented immigrants initially may result in a fiscal shortfall, the next generation likely provides a net benefit. Over 75 years, each immigrant represents $259,000 in net present value for federal, state and local governments, according to a September 2016 report by National Academies of Sciences, Engineering and Medicine on the economic impact of the U.S. immigration system. Once again, we have an example of the president — who probably has access to more information than any other person on Earth — latching on to dubious numbers that he saw on television. Compounding this error, he apparently misunderstood one number, assuming “aliens” meant “illegal aliens,” and then tweeted it out to the nation as a new, unknown fact. Given that immigration is supposed to be the central issue of his administration, there’s little excuse for such sloppy use of statistics. 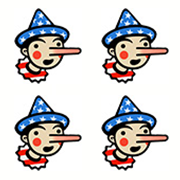 The president earns Four Pinocchios. “We are not even into February and the cost of illegal immigration so far this year is $18,959,495,168. Cost Friday was $603,331,392. There are at least 25,772,342 illegal aliens, not the 11,000,000 that have been reported for years, in our Country."